Now that we have safely passed mid-September, it is time for me to stop procrastinating and write my memories. To start with, what was NOT in one of my top memories: Hot Weather. We expected to be basking in the sun during our summer in central Europe; in fact, we had planned to ride early mornings to avoid the heat. However, it never happened (in fact, it rained frequently). The moderate Seattle-like weather turned out to be perfect cycling conditions for traversing the mountains of Belgium and France. If it had been 100 degrees, I suspect we may have never made it – a blessing in disguise. 4. Go-Karting. As sports enthusiasts, we are naturally adrenaline junkies. So we jumped at the opportunity to race go-karts in Mariemboug, Belgium. It was a much-needed diversion in the midst of high mountain plateaus. We had a fantastic time racing around the track, bumping each other and spinning out. It was an adrenaline rush that exceeded our expectations. Highly recommend it! (The only downside was that Janelle was ill that day and was unable to join us on the track). 3. Musee d’Orsay. Notwithstanding our go-kart addiction, we DO appreciate the arts. We had a fabulous time at the Musee d’Orsay. Unlike the Louvre (which spans millennia and all major geographical regions of the world), the Musee d’Orsay concentrates on the impressionist movement (late 1850 – 1915). The museum is easy to enjoy in a one-day visit to Paris (and much easier to tour than the Louvre). The Musee d’Orsay sparked hours of conversation for our family and inspired our boys: their sketchbooks are a friendly reminder that we’ll cherish. 2. Castle at Pierrefonds. Near the end of our cycling journey from Amsterdam to Paris, we cycled through “castle country” in Northern France (along the Oise River Valley). It was awesome! 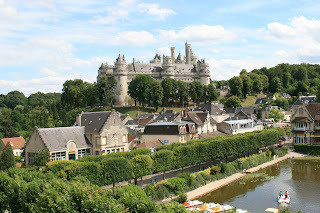 We saw countless castles and chateaus dotted across the French landscape. The last, and most impressive, was the Castle at Pierrefonds. Built, destroyed, rebuilt, bombed and restored again – this Castle has a timeless elegance that romanticizes knights and chivalry. Sitting on a hilltop above the quaint town of Pierrefonds, it looked like a movie set (in fact, Young Merlin is filmed here). We had a great time traipsing across the grounds, taking stations for battle, and imagining attacks and counter-attacks as archers and knights defending the keep. Fun! There was even a working catapult (about 20 feet in height) that looked like it was out of the Lord of the Rings. To top it off, the castle had an amazing display of tombs and sarcophagi in its bowels that were showcased by impressive lighting effects and holograms. See it for yourself if you are in Northern France. None of us will ever forget it. 1. Arriving in Paris after 1,398 kilometers of cycling (867 miles) from Amsterdam. Our last day of serious cycling was a lengthy 72-kilometer ride, but a capstone to a fantastic summer in the saddle. For many serious riders this journey would be an easy task, but for a family of four it was a long haul (each of us packing 40-50 lbs in our respective panniers). On the last day, we started in Senlis then made our way to East Paris (around the airport), then cycled in along one of major canals to the River Seine, landing at our apartment on Rue du Louvre. The ride was beautiful and there was a sense of elation (and relief) that we were about to enter Paris. It was great to finally “arrive” and get off the saddle – but bittersweet given that the journey was over. All in all, the days were long, but the trip was short. I already wish we were planning our next trip; it really was the trip of a lifetime. Other memories that deserve honorable mention: watching the final stage of the Tour De France in Paris along the Champs-de-Ellyses, going to a late-night medieval theater production (in French) at Coucy le Chateau Auffrique, climbing 400+ stairs in Liege, Belgium in the pouring rain, playing “silent” Marco Polo (no calling) at a B&B swimming pool in Ambleny, assembling makeshift fishing poles from carved sticks, dental floss, paper clips and gummy bears (a tribute to Montana), climbing the final ascent into Laon, going up the Eiffel Tower, and eating our farewell Paris dinner on Pont des Arts (Bridge of the Arts). yes I bought a purse.